This week’s story is about the blog. I’m not bragging (well, maybe a little) but I find some of these numbers amazing, especially the international scope of the visitors. The blog topped 20,000 views from 10,000 visitors in July, a couple of major milestones. A nice thing about WordPress is it keeps track of all these things. The blog has been in existence since the beginning of 2014, so this makes it 19 months old today. There are 56 pages (counting this one), each page being a self-contained story. Looking at the stats at 6:00 pm on July 31st, the blog has had 21,391 views from 10,130 visitors. That’s not much by viral blog standards but I think it’s not bad for this type of blog. By the way, if you are wondering about the weird two-letter labels on each page, they are a kluge to force WordPress to keep the page list in chronological order, most recent first. Without the labels WordPress will put the page list in alphabetical order. Back to the stats … since July 2014 there have been over 1,000 views per month with one exception – only 290 views in Sept 2014. I’m not sure what happened that month. There have been over 2,000 views per month three times. For the seven months of 2015 the average has been just over 1,660 per month. Where the viewers come from is to me the most amazing thing. I’ve ruled out the countries with only one view, assuming someone popped in for a second and realized it was in English and left. 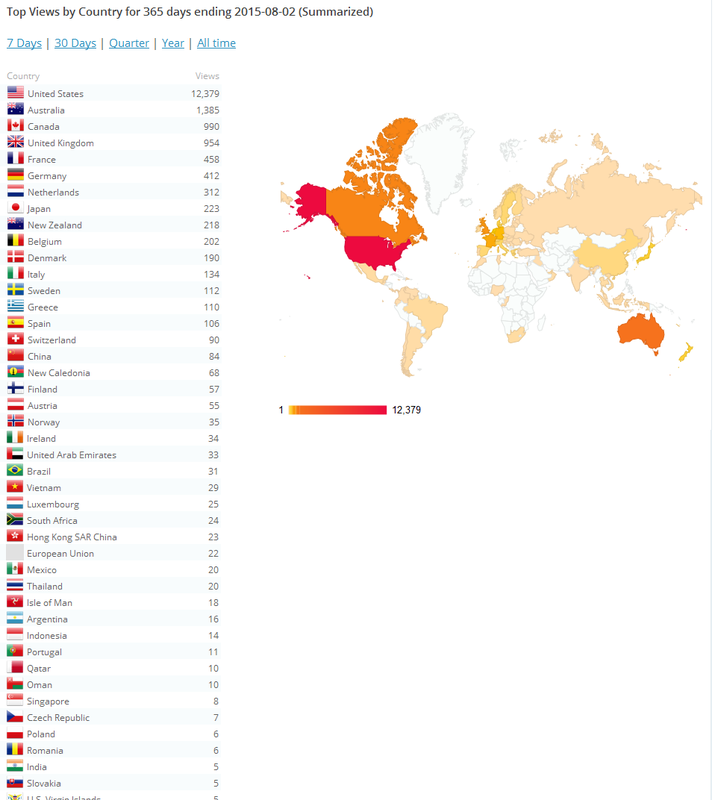 Even with those countries eliminated the blog has been visited by people from 64 countries. The United States is in the lead with nearly 14,000 views, followed by Australia with 1,647, Canada with 1,083 and the U.K. scoring 1,029. No real surprise here – these are all English-speaking countries and the blog is written in English in the U.S.
North America – U.S.A., Canada, Mexico. Central America & Caribbean – Guatemala, Costa Rico, Dominican Republic, Jamaica, and the U.S. Virgin Islands. South America – Brazil, Argentina, Chile, and Columbia. Europe = The U.K., France, Germany, Netherlands, Belgium, Denmark, Greece, Italy, Sweden, Spain, Switzerland, Finland, Austria, Ireland, Norway, Luxembourg, European Union (? ), Isle of Man, Portugal, Czech Republic, Slovakia, Romania, Poland, Hungary, Russia, Estonia, Slovenia, Ukraine, Jersey, Croatia, and Malta (I didn’t know Jersey, that little island in the English Channel, was considered a separate country). Africa – South Africa, Oman, and Morocco. The Middle East – U.A.E., Qatar, Bahrain, Turkey, Israel, and Iraq. Asia – Japan, China, Hong Kong, India, Thailand, Malaysia, and Vietnam. South Pacific = Australia, New Zealand, Indonesia, and New Caldonia. Below right: A graphical illustration of the location of the viewers. Left: A partial list of countries. I originally started this blog to help find a publisher for my book, “Racing the Gods” (https://www.octanepress.com/book/racing-gods). I was advised that publishers like to see unpublished authors having some visibility on the web. Now that the book is published that reason has gone away, but I’ve found I rather enjoy doing it. I will try to keep going until at least the end of this year. After that, well, we’ll see. Until then I hope you enjoy the stories.